Pauline Oliveros (May 30, 1932 – November 24, 2016). Composer and accordionist. Since last Halloween, a number of musicians who made a big impact on musical culture have left us for the great gig in the sky: composers Pierre Henry and Karel Husa; pianists Misha Mengelberg and Geri Allen; drummers Charles Bobo Shaw, Clyde Stubblefield, and Grant Hart (of Hüsker Dü); guitarists J. Geils, Bern Nix, John Abercrombie, and Dave Rosser (of The Afghan Whigs); Jaki Liebezeit and Holger Czukay of Can; Gregg Allman and Butch Trucks of The Allman Brothers Band; Mika Vainio of Pan Sonic; Prodigy of Mobb Deep; Walter Becker of Steely Dan; Greg Lake of Emerson, Lake & Palmer; and the iconic voices of Al Jarreau, Sharon Jones, Glen Campbell, Fats Domino, Chuck Berry, Chris Cornell, Tom Petty, and Leonard Cohen. 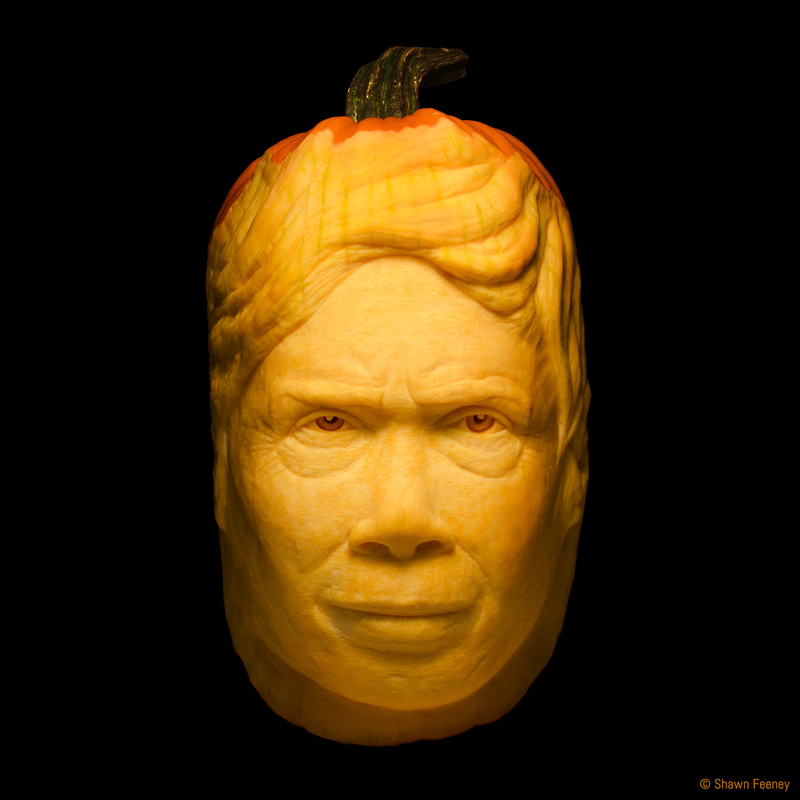 The subject of the tenth annual (and final) Memorial Jack-o-lantern is composer, accordionist, and deep listener Pauline Oliveros. She died on November 24 at age 84. Oliveros took up the accordion at age nine and enjoyed using it to create combination tones (new tones created within the ear when certain pairs of notes are played together). A pioneer of electronic music, she helped found the San Francisco Tape Music Center in the 1960s, and served as its director. Over the course of many decades, Oliveros developed the Expanded Instrument System, a signal processing system for use in improvisation and performance. She also got a black belt in karate, and was a fearless champion on issues of gender, race, ability, and sexual orientation. Thanks for the music Pauline, and may we learn to listen more deeply. This concludes the Memorial Jack-o-lantern series. Thanks for following along this past decade, and Happy Halloween.